Perennials, Annuals & Veggies: Tips, Tricks & Pix cubit: Myth #2: All Perennials Require little or No Maintenance. Myth #2: All Perennials Require little or No Maintenance. The second popular myth (see previous article for the first) associated with perennials assumes that, once planted, perennials maintain themselves. It may be true that some perennials do only require minimal maintenance, but many others require a lot. In addition, when perennials are placed in large beds in the company of many other perennials, maintenance is complicated and time consuming. It may seem no coincidence that perennial gardening was a Victorian development that continued into the earlier part of the 20th century. During this period of time, large scale gardening and exclusively perennial gardening was carried out on the estates of the wealthy by teams of expert but anonymous gardeners. Labour was cheap. 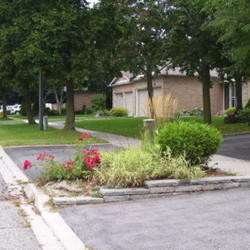 The picture (right - mid April) shows a perennial garden, which has been maintained for two years by a regular landscape maintenance company (with no knowledge of perennial gardening). This is mid April, before the weeds have begun to appear. The most important activities that contribute to the ease of maintaining perennials beds occur when the beds are first planned and installed. The initial preparation of beds and the selection of perennials to put in them sets everything else in motion. The location of perennial beds is an important concern. Many shade plants or plants that appear to be so (they bloom and set seed before trees leaf) bloom early. If the major intended attraction is ongoing and changing flower colours throughout the growing season, an adequately sunny location is required. The location should be weeded and prepared to a depth of a foot with weed-free organic matter. Any clay surface below should be broken up to avoid a sump effect. Access to water is important, particularly for newly planted perennials and during periods of drought. The advice of David Tomlinson (Merlin's Hollow, Aurora, Ontario, Canada) is that if perennial plants are still drooping in the morning, they need watering. Perennials require less frequent but deeper watering than annuals. In our sort of climate, watering should be done in the evening. Mulch is useful for retaining soil moisture, as well as for controlling the spread of seeding weeds and for enhancing soil fertility and structure. The choice of plants to place in the perennial beds is certainly crucial. There is enough to do in a perennial garden without continuously wasting time chasing invasive runners or seeders. Nevertheless, it may not be immediately evident whether plants are invasive or not. The same perennial may be well behaved in one growing environment and very invasive in another. In addition, all desirable perennials are not equally well behaved. After a few years, plant life in a perennial bed tends to degenerate into conflict, with the stronger set to replace the weaker. If the stronger win, the result is reduction in plant diversity. That means a reduction in the possibilities for continuous colour throughout the growing season. David Tomlinson's advice is plant a thug next to a thug. That way they can keep each other in check. With perennials generally, a wall or path can also help to limit the spread. Ribbon grass is very invasive, but it will not get past the concrete and asphalt (see picture: left - mid September) around this little flower bed. To a great extent, different plants belong in different locations in perennial beds, notably with the taller plants towards the back (or centre of an island bed) and shorter towards the front (see picture: below, right - late September). This placement, however, is not invariably the case, since low shade tolerant plants (e.g. lungbane, some primulas and barrenwort) are also useful growing towards the back. Their flowers can be seen in spring, before the sun is high and other plants have grown taller to flower. Some desirable, but running, perennials seem to quickly move towards the light at the front of perennial beds. 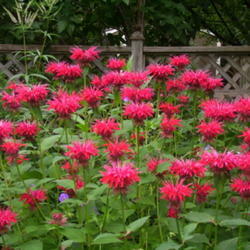 Bee balm is an example. Nevertheless, the lovely colour of a cultivar like 'Gardenview Scarlet' (see picture: below, left - early July) makes it well worth the job of returning it to a designated location each fall. That perennials often grow outwards and away from their original location is meaningful in terms of prospecting soil nutrients. Dividing, transplanting and removing exhausted centres of growth are excellent times to upgrade the soil. Many perennials require periodic division, some more frequently than others. Helenium, for instance, does better with division and soil upgrading every two or three years, while four or five seems fine for New England asters. On the other hand, it is better not to disturb deep rooted perennials, like balloon flower. It has been said that gardening is weeding, but there is easier weeding and harder weeding. If a flower bed starts largely weed free, if organic material added is weed free and if the gardener gets on top of the job of weeding in spring, the ongoing task is much easier. It only makes sense to eliminate seeding weeds (e.g. chickweed) before they flower and particularly before they set seed. Once the taller perennials get going they aid in weed control by shading out weed seedlings. Mulch has already been mentioned. Running weeds, like bindweed, can be a more difficult problem. Roundup is a possibility with runners, though I personally have not used herbicides (nor pesticides). Simply digging up, potentially at the time for division, removing the weed and replanting works for me. With regard to pest control, perennial gardening is its own solution; that is in terms of both the large diversity of plants required and the very large number of different perennials available. Perennial gardening is the antithesis of monoculture. There never is an excess of one type of plant and therefore of the type of pest it attracts. Also, if there is a particular pest that can not be handled by the natural predators, the perennial gardener can just stop using the plant(s) concerned. For me, this is the case with true lilies. Lily beetles breed on true lilies and fritillaria and also feed on toad lilies. These pests are difficult to control and make a very unsightly mess of the plants they fee d and breed on. It may seem unfortunate to abandon use of such plants, but there are lots of other wonderful perennials (see picture: right - early July) to use in their place. Clearing away dead and diseased plant material also helps to control things like powdery mildew and iris borer. Unlike annual gardening, perennial gardening requires cutting plants back during the growing season and not pulling them out at the end. Cutting back is done for aesthetic reasons, plant hygiene and allowing light to reach growing perennials that have not yet reached flowering height. The taller perennials in a perennial bed often need to grow upwards, past what has already bloomed. Perennials typically die back to ground level at the end of the growing season, generally leaving unsightly stems and foliage above ground. Personally, I cut the dead stems in perennial beds back to ground level at the end of the growing season. 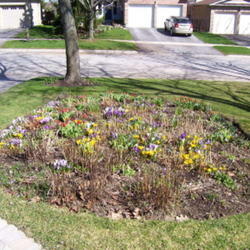 This is to allow spring bulbs (see picture: left - mid April) and perennials to be seen when they bloom. In our location the flower beds are protected by a snow cover all winter. They can not be walked over to tidy them up in early spring because they are soggy from the snow melt water. 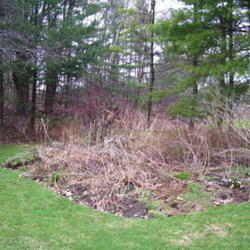 Clearing perennial beds at the end of the growing season does not have to affect birds. I clear the beds to ground level after migrating birds have left and provision the birds in spring (with shelled bird seed that does not germinate). Many perennials in perennial beds require staking, sometimes as a result of light conditions. If perennials are allowed to flop under their own weight or from heavy rain or wind, it seriously detracts from the look of the bed. Staking can also reduce any light induced tendency of taller perennials to grow at an angle over the top of shorter ones. Staking needs to be done at an appropriate time. 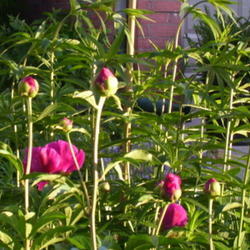 The culver's root in the picture (right: late May), behind the peony, is growing in height. Perennials like taller speedwells and giant bell flowers are just about impossible to return to an upright position and tie up, once they have been left to grow unsupported. Peony and tomato cages can be very convenient supports for various perennials. The cages must be positioned before doing so will damage the growing plants. Deadheading is another perennial gardener's task. Not all spent seed heads and the like are attractive and removing seedheads can help to manage perennials that tend to seed all over the place. 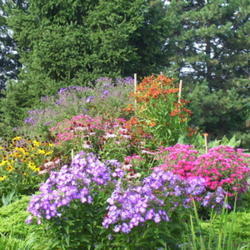 Nevertheless, the major reason to deadhead perennials is to extend their bloom time. For some plants, a smaller secondary bloom results. In the case of others, like rose campion and some tickseed and blanket flower cultivars, it keeps them in full bloom all summer long. 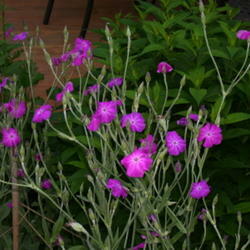 The rose campion in the picture to the left (mid June) is 'Flottbek'. Edging is another required job for grass borders. It needs to be done spring and fall. The maintenance tasks mentioned above are routine jobs in perennial gardening, but David Tomlinson also emphasizes the simple act of observing what is happening in perennial beds. Obviously, jobs like watering (as described above) require observation, but he is talking about monitoring the growth of the individual plants you obtain, even after following growing instructions. An old gardening adage says: "If you want to grow a particular plant, buy three and plant them in three different locations. The plant will tell you where it should have been planted". Rather than multiple purchases, it is a lot cheaper to just move plants around if they do not seem to be doing well. If perennials really did maintain themselves this article would be unnecessary. If there was little to the maintenance of perennials, the article could be a lot shorter. It is certainly true that if only a a few easily maintained perennials are used in a garden, there is minimal maintenance. For that matter, if an invasive is used in a restricted space for ground cover, there may be no maintenance at all. 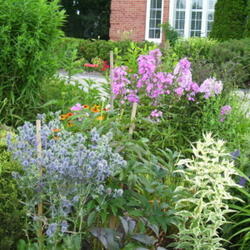 But if a wide variety of perennials are grown in the flower beds, keeping a perennial garden is all about maintenance.